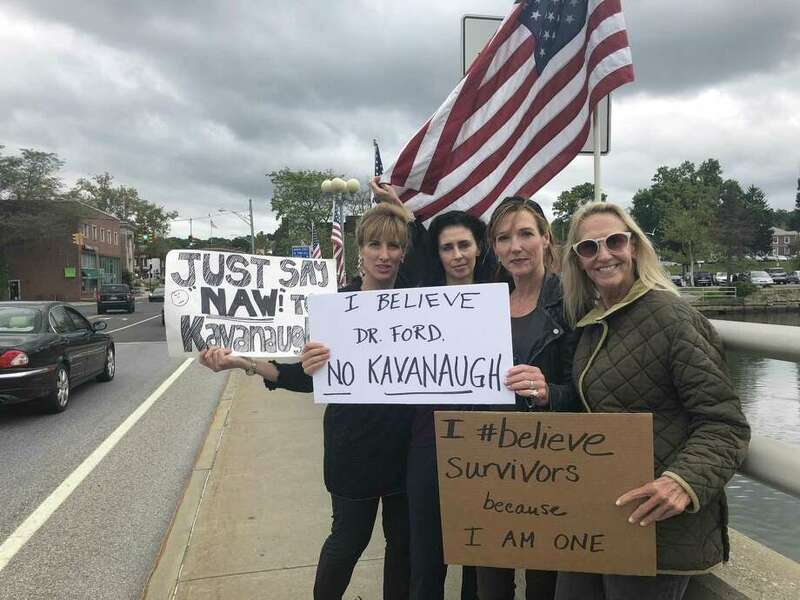 Westport women protest Supreme Court nominee Brett Kavanaugh at the Ruth Steinkraus-Cohen Bridge in Westport around 1 p.m. on Sept. 24. WESTPORT — Around lunch time Monday, a local activist called on her fellow Westporters to walkout in protest of U.S. Supreme Court nominee Brett Kavanaugh. Darcy Hicks, a Westport resident and organizer with the resistance activism group DefenDemocracy of CT, posted on Facebook at 12:24 p.m. that she was going to the Ruth Steinkraus Cohen Bridge over the Saugatuck River in Westport to join the national protest against Kavanaugh. Westporters had 25 minutes to put on black clothes, make signs, and drive over, Hicks said, adding she was thrilled about a dozen or so people showed up given the late notice.